Today's "Heil Carlisle" raid on deOccupy Honolulu clears corner -- but for how long? Day 277, deOccupy Honolulu. I swear, I was working on a pleasant, uplifting little article on the recent accomplishments, achievements, and precious moments at deOccupy Honolulu (at the art and political events in the park) when the third raid in three days cleared the whole corner. The City must be upset that yesterdayʻs raid was such a public humiliation for them. They had invited media to witness massive heavy equipment and armed force to close the encampment. But the deOccupiers had swapped out the tents making themselves exempt from seizure under the Bill 54 ordinance 11-029. The tents were swapped out again, but today they didnʻt bother following the law at all and just seized everything even though nothing was tagged and nothing was at all subject to seizure. Tell me if Iʻm wrong. Iʻm thinking that under pressure from lagging poll numbers, Mayor Carlisle sent a couple of cabinet members (Westley Chun and Kenneth Shimizu) and a buddy from his days as Prosecutor (Trish Morikawa) to the deOccupy Honolulu corner (Ward and Beretania) with a bunch of police, big body crews, bulldozers, dump trucks, and other heavy equipment to clear the corner at all costs. Then he could pop out his chest and boast about how he put these political dissenters in place. But how long will it stay cleared? Theyʻve done this before to no avail. Theyʻve either tagged or attempted seizure more than 30 times and they havenʻt managed to keep the protesters off the corner for the last 277 days. Iʻm thinking tents will be back on the corner this evening. RRrrrr. Okay, maybe Iʻm venting. 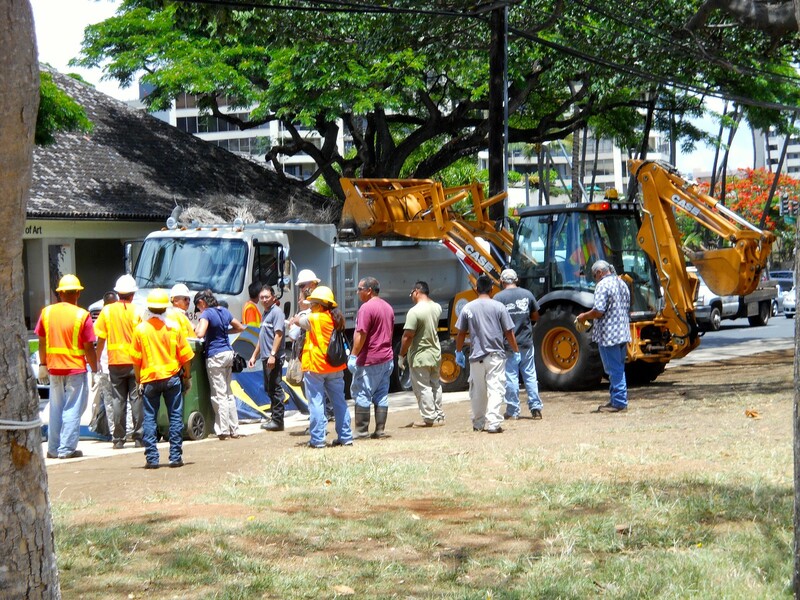 While I work on the uplifting article, I thought Iʻd show some photos and what not of todayʻs raid. Oh, Iʻm calling it the "Heil Carlisle" raid not just Director of Department of Facilities Management Westley Chun struck a perfect "Heil Carlisle" pose at the end of the raid, but because this method of controlling peaceful (and well organized) protest has been used before. By that other guy that compared poor minorities to "rat infestations." Anyway, Beretania is the street that many voters will drive down on their way to the polling station on Saturday. Just sayinʻ. Meanwhile, hereʻs a Flickr set of photos from todayʻs raid, plus a short video of Trish Morikawa stealing a tent, and links to the livestream recordings from me, Nova, and iZombies. Those should keep you occupied (no pun intended, really) until I finish drafting my article listing some of the significant achievements of the movement and encampment.